In 1989, Honda launched its GB500 as a retro-bike with styling and components that recalled fond memories for many motorcyclists of the classic British cycles. The GB500 was a clever package, designed to appeal to a new market that no current motorcycle maker had tapped: the classic, collectible cycles and the older enthusiast. 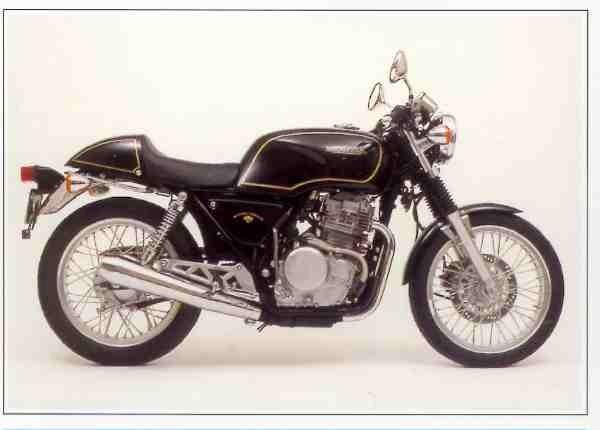 And while numerous British-cycle riders may have never given a second look at a Honda, the GB5OO won many a heart. The GB500's nomenclature spelled out exactly what the cycle was designed to be: the GB stood for Great Britain, belying the bike's styling heritage; the 500 denoted the 500cc displacement, in itself a tell tale, classic engine size. To top it off, the black and gold paint scheme of the GB500's gas tank, side panels and rear seat cover immediately called to mind the Velocerre and HRD-Vincent colors. BSA, AJS to Matchless. And even with current noise and exhaust emissions regulations, the GB500's engine emitted a deep-throated howl that echoed back to the past. The GB500 revived memories of many a past ghost - the beautiful British motorcycles of the classic era - and won riders' respect as a strong cycle in its own right.